Flying Saucer Stress Reliever is a true UFO. A Uniquely Fun Object to advertise your business and be remembered. All of our stress balls can be custom imprinted with your logo and /or message. They'll be able to see your brand name from outer space when you invest in this imprinted flying saucer shaped stress reliever for your upcoming event!With an overall size of 3 3/4" x 1 1/2", you can customize this item with your company logo or message. This product is not intended for children under three years old or for pets. 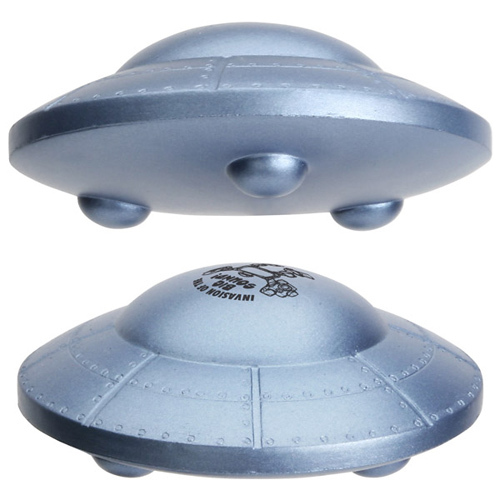 Perfect for trade shows and conventions, this UFO shaped stress toy is bound to bring you out-of-this-world exposure! Bulk / 23 lbs / 300 pcs. / 24" x 14" x 15"box. Imprint Area: 1-1/4" x 1-1/4"